Five years after the administration of ex-President Olusegun Obasanjo waived all legal claims regarding the Halliburton bribe scandal against the late General Sani Abacha's younger brother, Alhaji Abdulkadir Abacha, the panel of investigation into the scandal is still insisting that he must appear before it. In a letter of waiver, dated April 16, 2004 by Enrico Monfrini, Geneva, who acted as the attorney appointed by the Federal Government under former President Obasanjo had assured Abacha that there was no longer a case against him in the Halliburton bribe scandal. Affirming the letter of waiver, the Attorney General of the Federation and Minister of Justice, Chief Michael Aondoakaa, in a letter dated January 6, 2009 signed by the Solicitor-General of the Federation and Permanent Secretary, Abdullahi A. Yola, had also requested another prosecutor in the case, James John Matton of United Kingdom, to terminate proceedings against Abdulkadir Abacha/Rosewood International in the light of thecomplete waiver granted him and his companies by the Federal Government. The letter reads: “I am directed by the Honourable Attorney-General of the Federation and Minister of Justice to instruct you to terminate forthwith the on-going suit against Alhaji Abdulkadir Abacha and Rosewood International Limited before the High Court of the Isle of Man. It is my understanding that you have retained the law firm of Dickinson Cruickshank to pursue the matter against the two entities mentioned above. “The Honourable Attorney-General of the Federation and Minister of Justice (HAGF) is compelled to give this instruction in the light of the 'complete waiver' dated, April 16, 2004 granted to Alhaji Abdulkadir and his companies by Mr. Enrico Monfrini, acting as counsel to the Federal Government of Nigeria and with its full authority. “The waiver indemnifies Alhaji Abacha and his companies against any 'further of future legal action whatsoever and whosesoever to be brought by the Federal Republic of Nigeria'. “In view of the express language and intent of the document, the Honourable Attorney-General of the Federation is of opinion that there no longer exists any legal basis for the continued prosecution of this matter before the High Court of the Isle of Man. 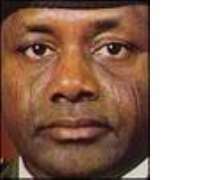 However, Abdulkadir Abacha's lawyer, told newsmen at a press briefing in Kaduna that his client was not on the run to avoid Halliburton panel of investigation as reported by some national dailies recently. Umar said his client had since replied the panel that he had to travel overseas for medical attention and would report himself to the panel whenever he returned to the country. Our client is not on the run because he has nothing to hide. “He doesn't belong to the so called elite, he is not untouchable and he doesn't belong to that cult. “This is a deliberate policy to investigate any thing about Abacha family just to divert attention of majority of Nigerians from serious issues in the country. “Despite the letters exonerating Abacha's brother, the present government is still interested in the case against our client, while most of the people involved in the Halliburton scandal are still in government. “I think government is playing politics with the case just to cover up other burning national issue like the mess in the power sector. “Well, our client is not in the country, he is likely to be in the UK, and we have written to the panel, and he will report to the panel as soon as he returns."